How can I manually create a SQL Server database to be used as a repository for SilkTest Workbench? 1. While logged in to SQL Server Management Studio, select an instance of SQL Server, right click and select “New Database”. 2. Assign a name to the database (i.e. SilkTest) and ensure the owner is either the owner or an owner with valid privileges before pressing “Add”. 3. 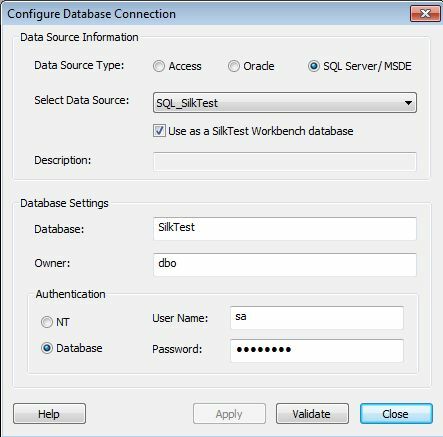 On the same machine as SilkTest 2010 R2 Workbench go to “Control Panel | Administration Tools | Data Sources (ODBC)” and create a new ODBC System DSN to connect to the SQL Server install by pressing Add and selecting the “SQL Native Client” driver. 4. Follow the workflow by first providing a name (eg. SQL_SilkTest) for the ODBC DSN and entering the hostname of the SQL Server install before pressing “Next”. 5. Choose the radio button for selecting the appropriate Authentication method you use to connect to the database – if using “SQL Server Authentication” you will need to add the Sa username and password, before pressing “Next”. 8. Select “File | New Database | SQL Server” and browse to select the data source just created in ODBC (eg. SQL_SilkTest). Next enter the database owner (eg. dbo) details, the User Id (eg. Sa) and the password before pressing create.